Another of my portraits of ordinary objects – this time a trash can in Rome, outside the Theater of Marcellus, at the foot of the Palatine Hill. The trash can sits at attention, doing its duty exposed to the elements. Neither rain nor snow nor ill-placed cigarette butts deter it from its appointed task. 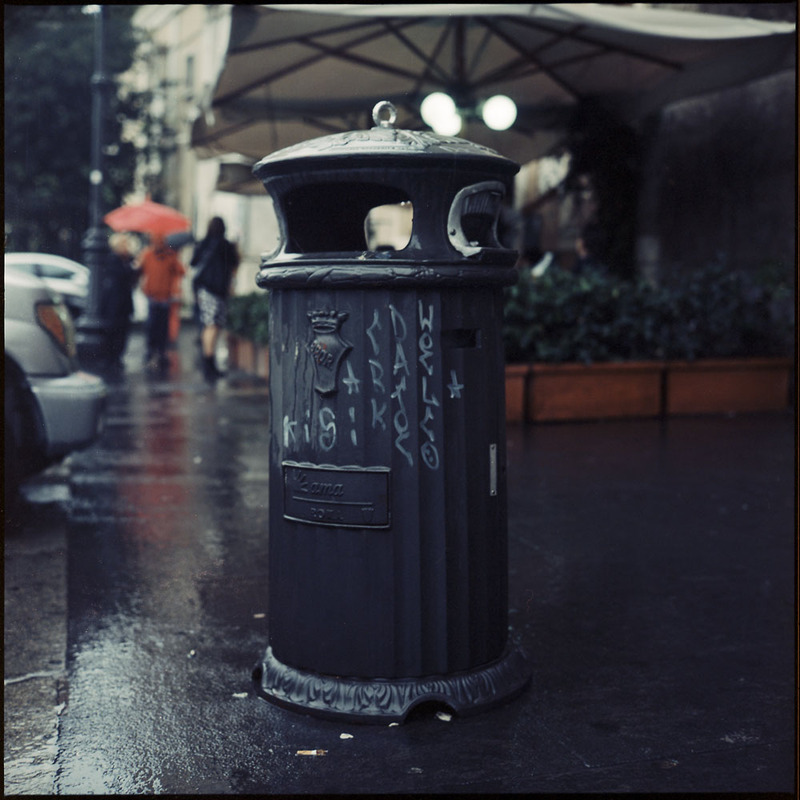 I don’t usually photograph in the rain, but I was so excited to be in Rome, running around and photographing without constraints, I didn’t care if people were staring at me as if I were some kind of freak, photographing a trash can in the rain with a 60 year old camera. This particular composition appealed to me because while the trash can is the center of attention and the star of the show, the background of the cafe umbrellas and the woman in the red coat with matching umbrella convey an extra level of that sense of how people turn their backs on public conveniences like trash cans and ignore them until they need them. Everything else is more important and more deserving of protection/attention.